Jared Petersen and Titus 2:11. 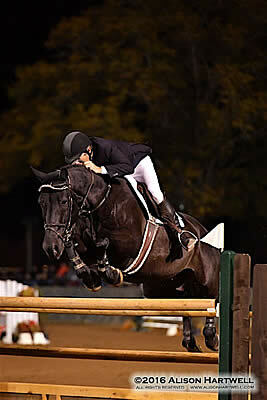 Week II of the Atlanta Fall Classics was jumping at the Georgia International Horse Park, home of the 1996 Olympics. The jumper action kicked off Thursday with the $7,500 Horseflight Open Welcome and nineteen horse and rider teams competed for the big check over a course designed by world-renowned designer Manuel Esparza. The first round time allowed was set at 83 seconds and only seven went clear and advanced to the second round. Derek Petersen of Archer, Florida and his own Diamant’s Legacy was the first to go clear in a time of 78.588 seconds and although their second round time of 35.730 seconds beat the 57 seconds time allowed, a heartbreak rail at the last fence would penalize them with four jump faults. His son Jared Petersen, also of Archer, Florida, and Derek’s own Titus 2:11 followed and advanced to the second round after posting a time of 78.588 seconds. After going clear in a time of 36.042 seconds, they would take the lead and set the new time to beat. Five trips later, Aida Sanchez Long of Chattanooga, Tennessee and Nelson Long’s ML Hartwick turned in a clear first round effort in a time of 78.248 seconds. Although the pair looked to take the lead with their clear second round, their time of 36.512 seconds would see them sitting in second place. However, there were still many rides to go. David Jennings of Franklin, Tennessee and KM Farms’ KM Corina turned in a clear first round in a time of 72.280 seconds, advancing to the second round. Their time of 36.530 wasn’t fast enough to take the lead and they moved behind Jared Petersen, bumping Sanchez Long into the third position. But with eight to go, it was still anyone’s class. Taylor Land of Atlanta, Georgia and Kim and Jay Land’s Nepal followed with the next double clear rounds in times of 79.654 and 38.967 seconds, respectively, which would find them temporarily in fourth place. Daniel Geitner of Aiken, South Carolina and Kelly Sims’ Charisma followed and turned in double clear rounds, but their second round time would not take the lead and they would finish in seventh place overall. Geitner returned with November Hill’s Vesta De Lavardin in the enviable last to go spot and turned in a clear first round in a time of 79.573 seconds. Their second round effort had them drop a rail in the combination in a time of 36.060 seconds which saw them finish in sixth place overall, leaving Jared Peterson and Titus 2:11 the victors. Aida Sanchez Long and ML Hartwick finished in second place while Jennings and KM Corina finished in third. Land and Nepal rode away with the fourth place ribbon while Derek Peterson and Diamant’s Legacy earned a fifth place ribbon. Geitner picked up the sixth and seventh place ribbons with Vesta De Lavardin and Charisma, respectively, and Abby Sjoberg of Ila, Georgia and Maggie Sjoberg’s Something Gained finished in eighth place. Ninth went to Ricardo Villa of Campobello, South Carolina in the irons of Pablo Mejia’s Reglissetop and tenth was awarded to Sarah Scheiring of Stockton, New Jersey and Molly Ben-Menachem’s Dontez. Jorge Ludwig of Newbury Park, California and his own Lamarique finished in eleventh place and Derek Petersen in the irons of his own Redeemed wrapped the class up with twelfth. The $35,000 Sidelines Grand Prix, presented by EMO, was the final Classic Company Grand Prix for 2016 and took place Saturday night, welcoming sixteen horse and riders to the Olympic Arena. Course designer Manuel Esparza set the first round time to beat at 95 seconds and only seven returned for the jump off round. Glenn Hartigan of Canton, Georgia and his own Z-Coco Cabana were the first to go clear in the first round, posting a time of 93.758 seconds. Welcome winner Jared Petersen, in the irons of his father Derek’s Titus 2:11, insured there would be a jump off after posting a clear first round in a time of 89.300 to the delight of the crowd. Taylor Land and Kim and Jay Land’s Nepal joined the duo after posting a clear first round in a time of 90.857 and Daniel Geitner of Aiken, South Carolina and the Kenwood Syndicate’s Kenwood followed Land and Nepal and added themselves to the jump off roster after posting their clear first round in a time of 93.139 seconds. Michael Tokaruk and Charlie Jayne’s Cupid Shuffle also turned in a clear first round in a time of 87.788 seconds to join the jump off round. Winner of the Week I Grand Prix, Fabio Andres Rodriguez, and Raylyn Farm’s Venus added themselves to the jump off order with their clear first round in a time of 89.425 seconds. The final clear first round was Jordan Coyne of High Springs, Florida and her own Lazaro with their time of 93.117. Hartigan and Z-Coco Cabana were the first to go and went clear, setting the new time to beat at 45.186 seconds. Derek Petersen and Titus 2:11 followed with their own clear round and beat Hartigan’s time with their own 44.394 seconds. Land and Nepal followed and dropped a rail, earning four jump faults in a time of 47.897 seconds which would find them finishing in seventh place overall. Geitner and Kenwood followed with a clear jump off round in a time of 42.632 and set the new time to beat, taking the lead. Tokaruk and Cupid Shuffle looked to beat Geitner and Kenwood’s time, but a rail in the combination cost them four jump faults with a time of 42.848 seconds. Rodriguez and Venus followed in the jump off order with a clear round, but their time of 45.721 would see them finish in fifth place overall. Coyne and Lazaro sat in the enviable last to go spot and while their clear round in a time of 42.736 seconds was fast, it wasn’t fast enough to catch Geitner and Kenwood and the pair would settle for second place. Jared Petersen and Titus 2:11 took third and Hartigan and Z-Coco Cabana placed fourth. Previous PostFEI General Assembly Votes in Favour of Olympic and Paralympic Rule ChangesNext PostFEI World Cup Vaulting 2016/17: The Countdown Begins – Who Will Be Triumphant?